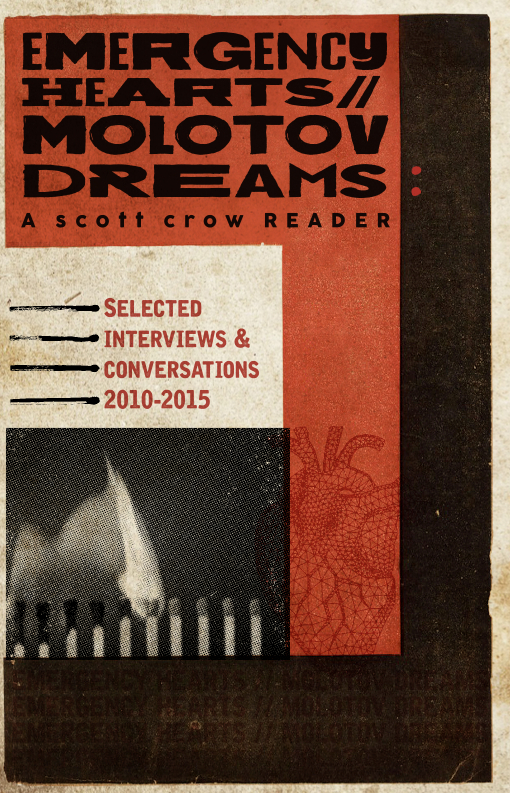 Emergency Hearts, Molotov Dreams: A scott crow Reader. Selected Interviews and Conversations 2010-2015. Emergency Hearts, Molotov Dreams is a selected collection of interviews, presentations and conversations that crow has given over the last five years covering a variety of topics such as anarchy, cooperatives, police brutality, prisons, animal liberation, environmental justice, surveillance and political movements. Many of the interviews have been expanded, remixed and edited from their original publications to expand on the ideas, praxis and histories. This book is from a new radical publishing cooperative GTK Press in Cleveland, OH, which is part of the longstanding bookstore called Guide To Kulchur. Interviewers featured: Abby Martin, Grayson Flory, Anne Gessler, Kit O’Connell, Vic Creatuure Mucciarone, Baruch Zeichner, Jonny Gordon-Farleih, Nathan Diebenow, Matt Tedrow, DJ Pangburn, and Darwin BondGraham. Including a co-presentation with Debbie Russell. Copies can be ordered directly from GTK Press, or picked up at one’s local alternative bookseller.